For the first time in recent memory, readers will not be able to visit with mystery author Carol Higgins Clark at the LA Times Festival of Books. Fortunately, Carol is still touring for Gypped, her new Regan Reilly novel. Fresh off their adventures in Atlantic City in Mobbed, the private eye and her NYPD officer husband, Jack, head for the West Coast and Los Angeles. A chance reconnection with a woman who appeared on a game show with Regan nearly a decade ago leads to Regan adding some investigation to her vacation. Carol has firsthand knowledge of television and film through her career as an actress, and has won awards for reading the audio editions of her novels. Mary Higgins Clark promotes I'll Walk Alone. ; Carol Higgins Clark promotes Mobbed. Mary Higgins Clark signs Just Take My Heart. ; Carol Higgins Clark signs Cursed (Reagan Reilly Mysteries, No. 12). Mary Higgins Clark discusses Just Take My Heart. 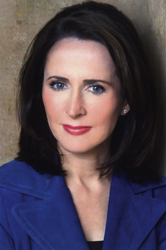 ; Carol Higgins Clark discusses Cursed. Mary Higgins Clark promotes Where Are You Now?. ; Carol Higgins Clark promotes Zapped (Regan Reilly Mystery Series #11). University of Scranton's Distinguished Author Award in September 2000, jointly with Mary Higgins Clark. Carol Higgins Clark is an American mystery author. She is also the daughter of author Mary Higgins Clark and has co-authored novels with her mother. She is the author of the Regan Reilly mystery series. She has also acted in several films. Carol Higgins Clark is currently considered a "single author." If one or more works are by a distinct, homonymous authors, go ahead and split the author. Carol Higgins Clark is composed of 9 names. You can examine and separate out names.